Butternut squash in my salad tonight? Yes. Yes please. When in season, butternut squash frequents my oven at least once a week. It’s inexpensive, flavorful, and oh so versatile. I prefer to cube it, roast it, toss it with freshly grated Parmesan cheese, and eat it by the bowlfuls. Another favorite delivery method of mine is to add butternut squash to tasty salads like this one. The hardest part about cooking butternut squash is peeling and cutting it. Here is a nice tutorial to point you in the right direction. This salad works for any occasion. Make it for your next dinner party, or for a simple and tasty weeknight dinner for 2. This delicious salad combines sweet, salty, and tangy together beautifully and deliciously. First, roast your butternut squash cubes. Preheat oven to 400 degrees F. Place cubes on a baking sheet lined with foil or parchment paper. Toss with olive oil, and season with salt and pepper. Roast for 30-40 minutes stirring half way through. Remove from oven, set aside to cool. Next, make the Honey-Balsamic Vinaigrette. In a small bowl combine balsamic vinegar, honey, Dijon mustard, salt and pepper. Stir until well incorporated. Slowly whisk in the olive oil until dressing is emulsified. You can also combine vinaigrette ingredients into a mason jar, secure lid, and shake away. Next, make the candied walnuts. (Note: You will only use 1/2 cup of the walnuts from this recipe. The leftover walnuts can be kept in an airtight container for up to 2 weeks.) If you do not want to make your own candied walnuts, you can use store bought. 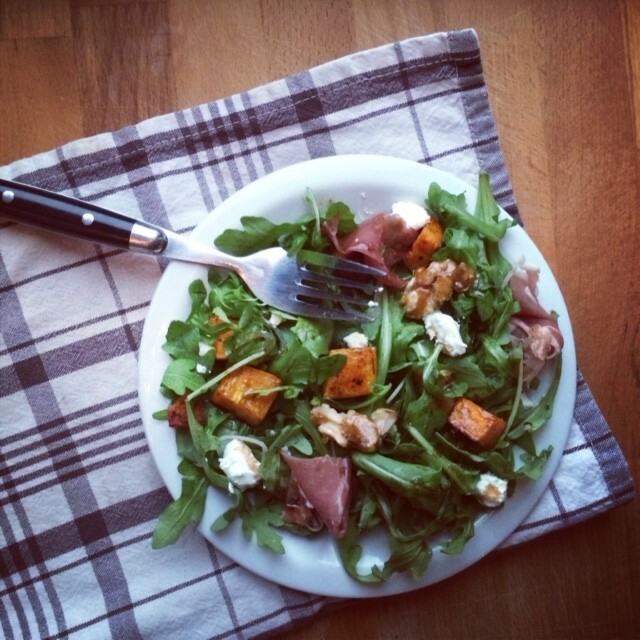 In a large bowl combine arugula, butternut squash, shallot, and dried cranberries (if using). Toss with the vinaigrette until well coated (you will not use all of the vinaigrette). Add the prosciutto, and candied walnuts. (Note: I like to twist the prosciutto into small spirals and place them neatly on top of the arugula.) Top with goat cheese, and serve immediately. Pingback: Roasted Squash and Shallots | What's On the Stove?